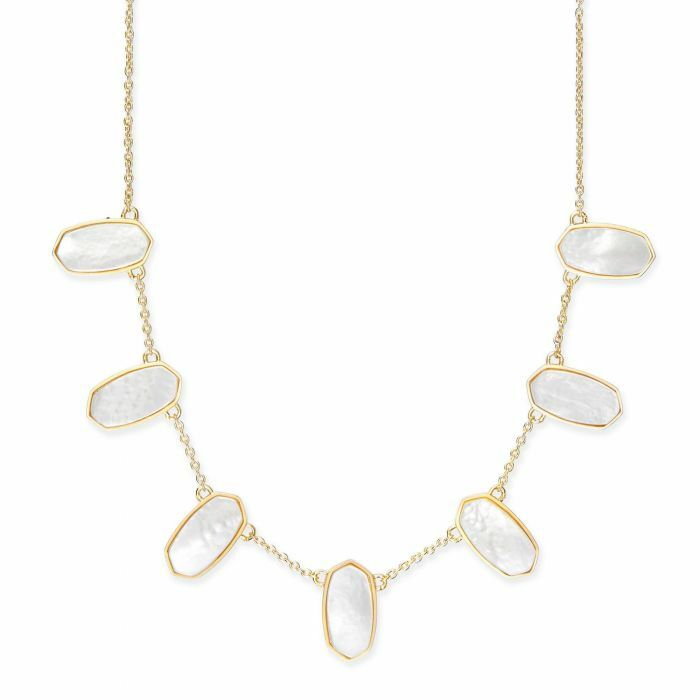 From the Kendra Scott Spring 2019 Collection, the versatile Meadow bib necklace is reversible and can be worn to show either shimmering stones or solid brushed metal stations. Boasting the best-selling ivory mother-of-pearl colorway, this style will add a soft neutral hue to your neckline. This necklace is 14k gold-plated over brass and has a dual functional closure with a lobster clasp and an adjustable chain that allows the wearer to find the perfect length. This necklace reaches a total of 18 inches in length, the stations are .6 inches in length and width.